This Cross Country flight will provide a new test for your VFR flying skills. The last flight ended on Block Island, which is surrounded by Block Island Sound. As is sometimes the case with bodies of ocean water, weather conditions frequently create low clouds and fog. For your departure from Block Island, you’ll be faced with a real go/no go decision, and should you decide to launch, you may find yourself wishing you were back on the ground. For this trip, you’ll be flying to Southbridge Municipal Airport, just over the northeast corner of Connecticut in Massachusetts. The town is southwest of Worcester, but is perhaps best known for its exit on the Mass Turnpike where I-84 branches off towards Hartford and New York. And don’t confuse it with Stockbridge, MA, of “Alice’s Restaurant” fame; if you want a meal at the Southbridge Airport, try the Windsock Diner located right on the field. The route is fairly straightforward. Since there are not a lot of pilotage landmarks to use on this trip, I’ll plot a simple course with two legs—both based on the same VOR. But navigation is not going to be the issue, at least not at the start. Before you can get off the ground, you’ll have to cope with the weather. So here you sit on Block Island, staring up at the sky and not liking what you see. What you’ll see is not the standard Flight Simulator “severe clear”; instead, there are clouds above you and not that far above you, for that matter. Look to the west, and the weather doesn’t seem to be that bad—there seem to be plenty of holes in the cover—but looking to the north where you want to go, it looks like the cloud deck may be filling in. Checking the current weather observations, you find out that it’s clear in Hartford and Boston, and there’s a low, thin, broken layer over Providence. So it sounds a lot like this is a localized condition. Sitting around the pilots’ lounge, you find that the opinions range from forget flying today, to wait a few hours and maybe it will burn off, to go for it—find a hole to climb through and you’ll be able to fly on to your destination without a hitch. Now, if you’re a student pilot, you are not allowed to fly solo without being able to see the ground. This is generally a good idea for non-instrument rated pilots as well, even though it is legal to fly VFR over a solid deck of clouds. The reason that you might want to be more cautious than the law requires is that an engine failure or other emergency could leave you with no way out except through the clouds—and you have no idea what’s under them. Fortunately, a few pilots have just landed after completing IFR approaches to the island, and they all tell you that there seem to be plenty of holes to get up and down through, and the tops of the clouds seem to be at around 1,000 feet, so you should be able to climb and cruise above them with no problem. You decide to take a look for yourself. What will you find? The portion of the World Aeronautical Chart (WAC) for the area shows your route. At this scale, the crowded New England region results in a fairly cluttered chart; for more detail and a clearer picture, you might prefer to use the New York sectional instead, though that chart has its own problem in that you have to flip from one side to the other midway through your flight. Fortunately, a straight shot from Block Island to the Putnam VOR (117.4 PUT) keeps you well to the west of the Providence Class C. Before you take off, you’ll tune your NAV2 radio to this beacon, and set the OBS to 360, since that will be about the correct heading. Once you have completed your climb out and managed to get clear of the clouds, you can then center the needle using the OBS adjustment and fly direct to the VOR. Once you reach the VOR, you’ll turn to a heading of 329º magnetic, and Southbridge will be 12.3 miles ahead. Watch the DME readout for NAV2 as you fly along; if it gets to 12 miles and you haven’t spotted the field yet, you might want to double-check your navigation. Southbridge has a grass Runway 10-28 and a paved 3,500-foot Runway 2-20 that is 75 feet wide. Field elevation is 697 feet, with pattern altitude at 1,697 MSL. I’ll plan on a relatively low cruising altitude—3,500 feet—for the trip and our standard Cessna 182 cruise of 130 knots. This means that you’ll need to lose nearly 2,000 feet, and at a standard 500 fpm descent rate, this means that you’ll need to start letting down four minutes from the pattern, or about 10 miles from the field. 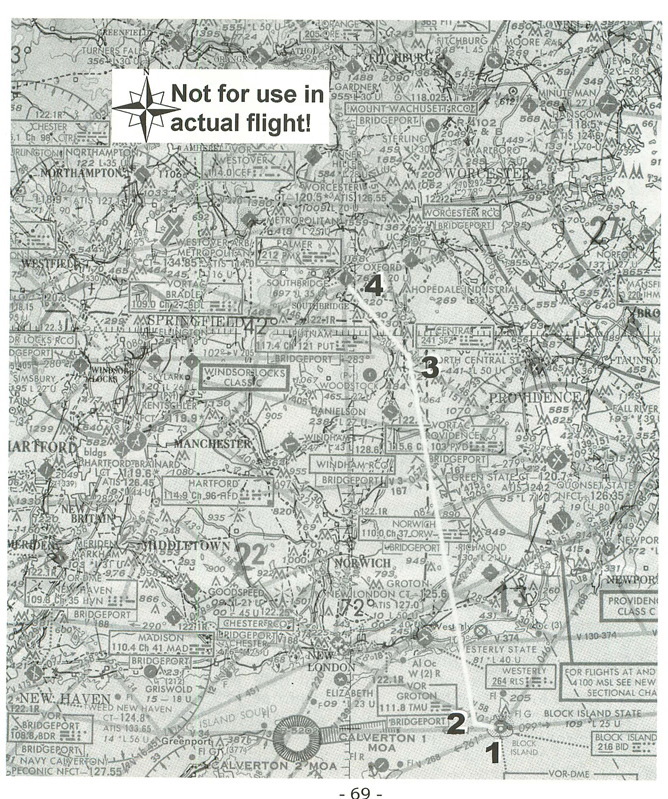 Since the airport is just 12.3 miles from the VOR, you may as well plan to start your descent right when you make your turn so you are stabilized at pattern altitude well before you get to the field. When you reach the field, enter on a 45-degree angle for a left-downwind leg for Runway 20. I have worked up a flight log for the flight; it’s a bit simple compared with some of our other flights in the past. But don’t worry; you still have the weather to confront. The troublesome weather on this trip is made possible by the FS5.1 weather area feature, but it does take a bit more setting up than most Cross Country flights. Start by choosing the Airport command on the World menu. Pick “USA - New York” as the scenery area, and then pick “Block Island State - Runway 28” from the list. This will place you at the end of Runway 28, ready to take off. Next, choose Weather on the World menu. Then pick the Add Area button, which will open the Add Weather Area window. Give the area a name; I decided to use “Block Island Sound”. In the “Beginning Lat:” box enter 41, and in the “Beginning Lon:” box, enter 71. For the “Width”, enter 50, and for the “Transition”, enter 5. Don’t enter anything for any of the other fields on this window; just choose OK to close it. Now make sure that you have Block Island Sound selected as the Weather Area on the Weather window. Make sure that the Clouds option is selected, then choose the Create button to create a new cloud layer. Leave the Type as “User-Defined”, and give the layer a Base of 500 feet and Tops of 1,000 feet, with Coverage of “Broken 6/8” and a Deviation of 50 feet. (If you’re feeling brave, increase the coverage to 7/8.) Then choose OK.
Notes: Deer reported in vicinity. Back in the Weather window, pick Visibility, and set it to 20 miles for both the Global and the Block Island Sound weather areas. Choose OK when you’re finished to close the Weather window. On your cockpit panel, the NAV1 should be set to 117.8, which is the Block Island VOR. Leave this set as it is, just in case you decide you want to return to the island instead of continuing your trip. Set NAV2 to 117.4 for the Putnam VOR and set the OBS to 360. You may also want to check your Scenery Complexity choices from the Scenery menu; View 1 should be set to Very Dense for best effects. If you have the CD-ROM version, you can also use the Scenery Library command to turn off the North American extra scenery if you want.There’s one more option you might want to change at this point. Under the Preferences command on the Options menu, the Display screen has a Scenery Display Options button. Here you can select Wispy Cloud Effects and Cloud Thickness Effects. The Wispy Cloud Effects causes your view to be gradually obscured as you enter the edge of a cloud, just as it would in real life. The Cloud Thickness Effects show how high the clouds rise above the base altitude; without this effect, you only see a “footprint” of the clouds, but cannot tell when you might fly into a portion of cloud rising about that footprint. Unfortunately, the thickness is portrayed using blocks that look like they were left strewn about by some celestial toddler, which is not realistic at all. In this particular case, however, you might want to enable this feature since you will need to know just where the clouds are so that you can avoid them as you climb out from the island. If you want to add some more challenge, make your take-off time about 7:00 PM, so that you have dusk and darkness to deal with as well before you finish your trip. The weather reports say it’s clear inland, and it sure looks like you should be able to climb out through one of these holes. So stay out of the clouds, and give them plenty of clearance to the sides and above so that you stay in legal VFR conditions. Make sure that you have some place in sight where you can set down in an emergency, and hope that the weather reports are true!